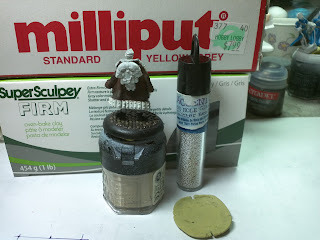 Here is a quick tutorial on how I made the armored greatcoat. First I mixed equal parts of the milliput mix together with Sculpey. This creates a nice compound that is easy to work with and hardens well. After that was all mixed I pressed the putty flat in between some parchment paper and cut into a nice long strip with my blade and ruler. Carefully I set the strip on the mini and tap it down into place with sculpting tools, being watchful not to cause and dings. For each panel I simply make a small knife line and used the sculpting tools to fix the shape I wanted. Now the hard part, placing the beads into place. Since these are so very small and have a static cling to them, the simplest way I found is to use a moistened toothpick to pick each on up and set them into place. Once the putty is cured you can go back and glue any beads that have slipped off. Wow I didn't realize you had scratch built that cost, it looks fantastic! You may not have them, but more pictures for future tutorials? nice break down on that one my friend. I've really got to learn how to start doing stuff like this so I can improve my figs.